First and foremost, it’s meaty. Unlike the lighter and flakier white fillets — such as flounder or tilapia — a quality cut of swordfish could easily play the part of a steak in a pescetarian’s diet thanks to it’s full-bodied texture. Secondly it’s mild in flavor, which allows for flexibility and makes it a great “starter” fish for anyone looking to incorporate more fish into their diets but are hesitant on whether or not they *love* it. And finally, swordfish is a sustainable option. Best options are caught by handlines, harpoons, or buoys from the North Atlantic, South Atlantic, and U.S. North Atlantic. You may also find good alternatives at your market, which are caught by large mesh drift gillnets, pelagic longline, or shallow-set longline from California, U.S. Atlantic, U.S. Gulf of Mexico, Hawaii, and the East Pacific. But as always, if the fish your eyeing isn’t labelled, ask your trusty fishmonger. So okay. You’ve probably heard (or read) me say that I try to stay away from dill-y and lemony sauces when it comes to fish — especially salmon — because it’s a little too standard and, if I can be honest, kind of humdrum. What can I say? I eat a lot of fish, and I like to keep things exciting with miso-glazed salmon and cod with beer and mushroom sauce. BUT. Capers are a total game-changer, and swordfish is pretty damn awesome when done simple. So this recipe? It’s a win. 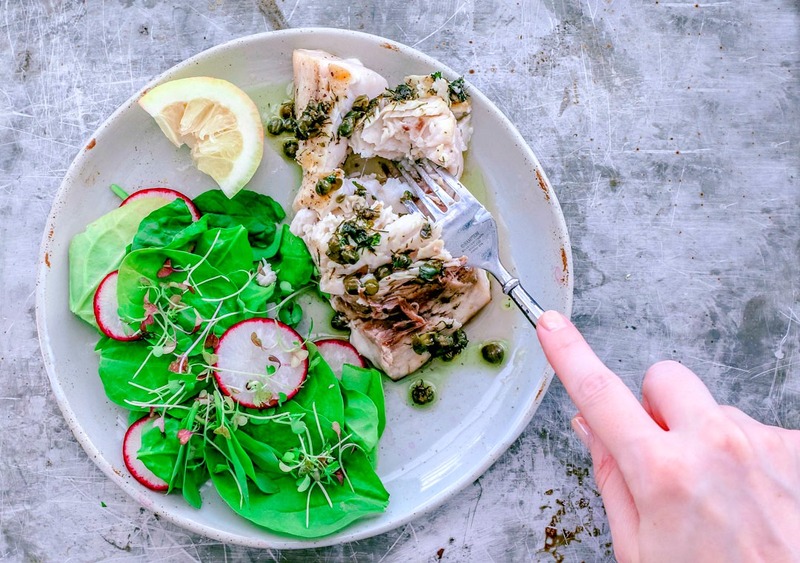 This brightly flavored swordfish is patio dinner perfection with fresh dill, briny capers, and hints of lemon. Pre-heat the grill to medium-high heat. Dip a wad of paper towels in some oil and, holding the wad with tongs, wipe the grate. Do this multiple times re-dipping the towels in oil as needed until the grate is black and glossy. This may take 5-7 oily wipes. This process "seasons" the grill for you, much like a cast iron pan, so your fish won't stick to the grate. Blot the fillets with a paper towel and brush top and bottom sides with olive oil, then season with kosher salt and pepper. Place the fish skin-side down on an angle, diagonal to the grate slats. Reduce the heat to medium, cover the grill, and cook for about 2 to 4 minutes without moving the fish until the skin side is crispy and golden brown. With a spatula, try to lift a fillet after 2 minutes; if it doesn’t want to let go of the grill, continue to cook, checking at 30-second intervals, until it wants to release. When ready, flip the fish over using two spatulas for better control. Remember to keep the fish diagonal to the grate slats. Cover the grill and cook for approx. 3-7 minutes (this really depends on the thickness of your fillet). Your fish is ready when the center is heated to 145 degrees F and is opaque. Once the fish is ready, heat a saucepan over medium-low heat. Add the butter, and once melted, add the lemon juice and lemon zest. Bring it to a light simmer, then add the fresh herbs and the capers. Stir well, and keep the simmer for approx 30 seconds. Reduce heat. Spoon the butter sauce over the fillets upon serving. The butter sauce is quick to make, so you start it right before serving. If you start it early and let it sit, the butter will develop a film and thicken. So delicious!! Capers and fish are a win-win!!! Pretty feed! Thanks, Lindsay! Couldn't agree more. There's just something about capers (likely that subtle dilly-ness) that makes them *perfect* for fish!